On Opening Day, Reds manager Bryan Price appeared to anoint Kevin Gregg as the 8th inning setup guy for the Reds. That may or may not change (and may have already changed), but it was a curious decision from the beginning. After all, Gregg was a non-roster invite to spring training, and hadn't particularly distinguished himself. Let's just say that most informed observers were skeptical of the decision to depend on Gregg in high-leverage situations or, indeed, in any situation at all. But he's a Former Closer (TM), and a veteran, so Price was inclined to trust him. After two outings now, Gregg has been ineffective, to say the least. Kevin Gregg's career deserves a tombstone, and the epitaph might read: "More career saves than Brian Wilson. He probably never should have been a closer." Only a matter of time before the Reds dump this guy and bring Sam LeCure back to town, I hope. Please? When Brayan Pena is managing the Reds on his PlayStation, he doesn't care what inning it is, when he needs a big out, he calls on Aroldis Chapman. "When you've got a guy like that throwing 100 mph, why not?" Pena said laughing, before adding he only calls fastballs for Chapman in those situations on the PlayStation. I've been complaining for years that Reds managers won't use Chapman in the most high-leverage situations, preferring instead to save him for the typical ninth-inning appearance. (I've also been complaining for years that Chapman is a closer instead of a starter, but let me save that rant for another day). Frankly, Chapman is criminally under-used. If Pena can figure out the best way to use your best pitcher because of a video game, perhaps we need to chip in and send Reds manager Bryan Price a Playstation 4. I'll pay for the copy of MLB 14: The Show myself. Yesterday, my favorite baseball player was elected to the National Baseball Hall of Fame. 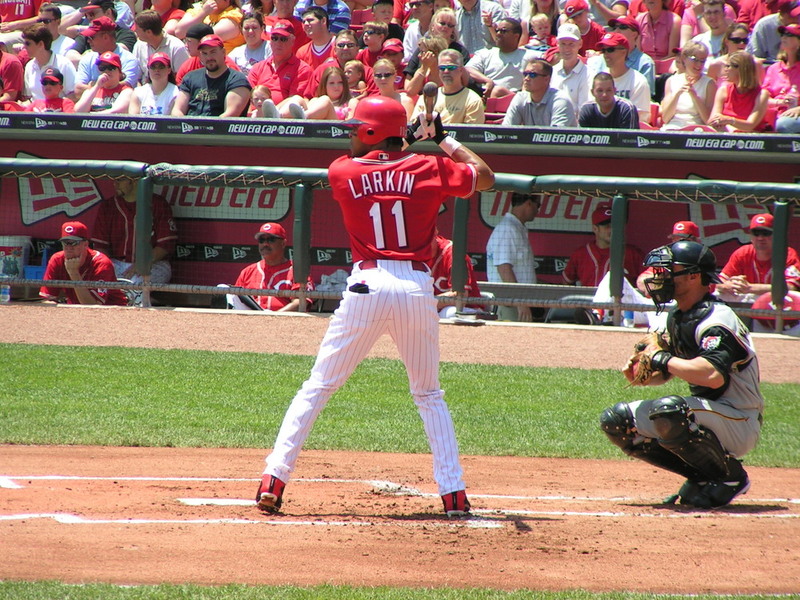 Barry Larkin, of course, played for the Cincinnati Reds his entire career. I watched and listened to a lot of Reds games during those years, and Larkin was simply a joy to behold. He should have been elected to the Hall of Fame two years ago, but we'll take what we can get. For some reason, my most enduring memory of Barry Larkin came in Game 2 of the 1990 World Series. 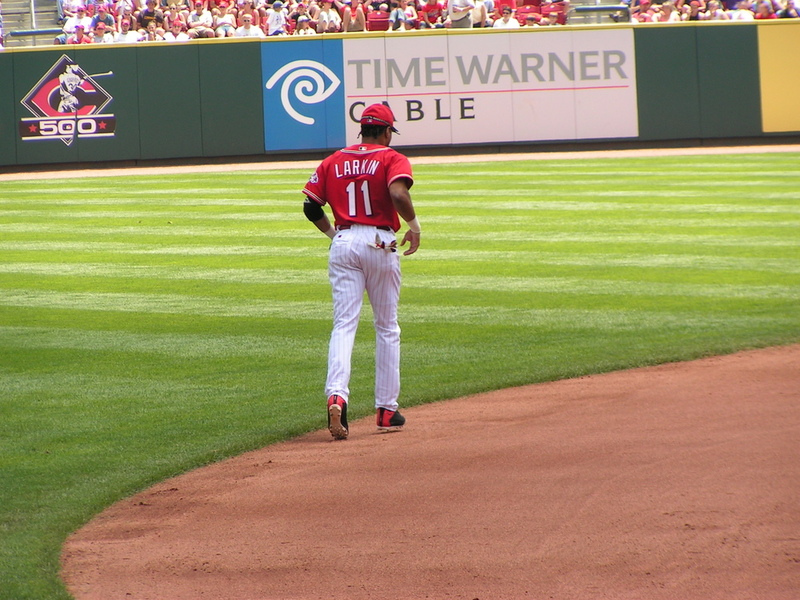 The World hadn't really been fully introduced to Larkin yet, but Reds fans were already beginning to realize what a special kid we had playing shortstop. In Game 2, the A's had taken the lead in the top of the first when Larkin stepped to the plate. Two pitches later, Bob Welch (that year's Cy Young winner) had Larkin in an 0-2 hole. I'll never forget that next pitch; it was a fastball and it's no exaggeration to say that the ball was eye-level. Inexplicably, Larkin took a mammoth swing and hit a ground-rule double. By the end of the inning, the Reds had taken the lead and my confidence that the Reds could actually pull off a victory was restored. I guess the reason why I remember that play most was that it was so unlike the Larkin I came to enjoy throughout his career. Larkin was a guy who did the little things correctly; he was a great fielder, an excellent base-runner, he took a walk. On October 17, 1990, he hacked at a pitch, and I'll never forget it. STL informs us that the top-ranked UVa baseball team has won a couple more honors. Second baseman Phil Gosselin was named Player of the Week in the ACC, and Danny Hultzen won Pitcher of the Week in the conference. The official release with all the relevant information is in the extended entry. The Hoos play VCU tonight. It's the last game before a 9-day break for final exams. After that break, Virginia will host the UNC-Chapel Hill Tar Holes in an important ACC matchup. After tonight, only seven games remaining in the regular season before the fun really begins. The No. 1-ranked Virginia baseball team swept the ACC Baseball honors for the week ending May 2, as infielder/outfielder Phil Gosselin (Jr., West Chester, Pa.) earned Player of the Week laurels, while Danny Hultzen (So., Bethesda, Md.) was named Pitcher of the Week. It marks the first such honor for Gosselin, while Hultzen earned the distinction for the third time in his career and the second time this season (March 1). The ACC hits leader with 77, Gosselin had hits in all five games (including four multiple-hit games) as Virginia completed a perfect week. Last Tuesday, Gosselin broke a scoreless tie with a two-out grand slam in the second inning of Virginia's 6-3 win over Coastal Carolina, which was ranked as high as fourth nationally. The next night, he tied a career high with four hits against Georgetown. Gosselin then went 6-for-16 over the weekend at Duke, with three doubles. For the week, the Cavaliers' leadoff hitter was 12-for-25 (.480), had a .500 on base percentage and posted a team-best eight RBI. Hultzen tossed his first career complete game in dominating fashion, facing just five batters over the minimum in a 12-3 road win Friday at Duke. He held Duke to its second-lowest hit total of the year while retiring the last 10 hitters and 21 of the final 22 batters that he faced. Ten of the final 21 outs came by strikeout. During that stretch, only five balls left the infield. Overall, the ACC's strikeout leader (94) tied a career high with 13 strikeouts while not walking a batter. He went to a three-ball count to just two of the 32 batters he faced. Virginia plays host to VCU at 6 p.m. Tuesday in the Cavaliers' final game before a nine-day break for final exams. Another great weekend for the baseball team. Yeah, it was just Duke, but still...these are games Virginia must win. The Hoos are ranked number one in the country, swept Duke, and perhaps most importantly, moved into a tie atop the Coastal Division in the ACC standings. Glad to see Coach O'Connor's guys taking care of business. VirginiaSports.com has a good interview with Branden Kline, one of the more exciting young pitchers in the ACC. The updated Director's Cup standings have been released, and UVa has dropped to 8th (they were 5th previously). Eighth, of course, is the highest finish Virginia has ever accomplished in this particular competition (UVa was 8th last year and in 1999). The baseball, lacrosse, and tennis teams are almost assured of garnering more points for the University, so Virginia appears to be almost a lock for their highest Cup finish ever. That's a credit to the individual coaches, but also to Craig Littlepage who, as AD, has presided over the rise to prominence of the Athletic Department as a whole (even as the football and basketball programs have cratered). Coastal Carolina's baseball team is not accustomed to losing. Then again, not every day do the Chanticleers face an opponent ranked No. 1 nationally by Baseball America. This week that team is UVa, and the Wahoos (35-9) showed why Tuesday night. Thanks to Phil Gosselin's second-inning grand slam, Virginia never trailed in a 6-3 win over 10th-ranked Coastal before 2,260 fans at Davenport. Brian O'Connor's 300th victory as the Cavaliers' coach ended the Chanticleers' 17-game winning streak. Coastal (36-6) hadn't lost since March 28. "We definitely were jacked up to go against those guys," said UVa catcher John Hicks, who went 2 for 4 and threw out two baserunners. "They're a very good ball club, and you could definitely tell in the clubhouse before the game that we were ready to go, we were excited for it." The team is looking really good right now; I'm anxious for the postseason to get here. I'm also excited to see the development of Branden Kline, who got the start against CCU and looked great. He's just going to be a stud next year, that's all. How about the Hoos? After winning game one of tonight's doubleheader 5-1 behind Danny Hultzen, UVa won the nightcap over Maryland, 27-4. 27-4! The only way that could be sweeter is if Gary Williams were Maryland's baseball coach too. STL has previewed this weekend's baseball series against Maryland. Good opportunity for the Hoos to gain some ground in the ACC. Inside, the Virginia skipper was stewing about the one that got away. His Cavaliers came within one strike of sweeping the visiting Hokies in the three-game set, but instead the Cavs came unraveled in the ninth inning and dropped an 8-5 decision. In the process, his two most reliable relievers, Kevin Arico and Tyler Wilson failed in the clutch, allowing Tech to score five runs in the top of the ninth for the win. Until then, the day had gone pretty well for the Wahoos. Playing before a third consecutive sellout crowd of 4,219, Virginia had found a way to beat the heat of Hokies starter Jesse Hahn, who hit the 96 mph mark with regularity on the day. Sunday starter Cody Winiarski had handcuffed Tech’s batting lineup, scattering four hits and issuing no bases on balls. Reliever Branden Kline gave UVa two flawless innings of relief and centerfielder Jarrett Parker seemed to have rediscovered his batting groove with a 3 for 4 (two RBI) day, including a home run. Losing a game like that is always a punch in the gut, but losing to the Hokies in this fashion...well, that's another thing entirely. Am I the only person who still isn't comfortable when Arico comes into the game? He kinda scares me far too often. Still, let's keep it in perspective. The Hokies aren't a bad team -- they are ranked in the top twenty -- and the Hoos did take two of the three games. Yes, a sweep would've been nice, but that happens. The Hoos are going to have to put it behind them, because they have some work to do to keep pace in the ACC. They can't let Georgia Tech and Miami get too far ahead. Collegiate Baseball newspaper has released its first poll in anticipation of the upcoming baseball season. Our Cavaliers are ranked third in the country, behind Texas and LSU. With snow all around me and a house that is dark without power...it's disconcerting to read anything about baseball. On the other hand, reading about the powerhouse Hoos baseball program is enough to give even the grinch some warm fuzzies. Or something like that.